Datamining MTGO is about to get a bunch harder. I can't find the original post link Here's the link and here's the screenshot that's currently making the rounds. Skip past the image for just the relevant quote. ...players will no longer be able to watch replays of matches or events they did not participate in. It seems funny to me that WotC wants to make ban and restriction decisions based on real-world data while also effectively outlawing the ability to collect, verify, or review that data. Hopefully at least Matt and Ryan can/will keep participating and mining for the Premier events for us. This is worse than a Luddite attitude. This would be akin to the Luddites making their own clothing out of high powered looms while smashing everyone elses. Anyway, I assume that "if you participate in a tournament you'll be able to replay any of the matches from that event" means we are fine as long as one of us continues to play in the P9 challenges. If we're both busy we might need to recruit some help though. As a statistician, this information is difficult for me to comprehend. Since when is restricted access to data a beneficial change? What can I infer about the official stance regarding the staleness of a format? If we look at the recent happenings in Modern, WoTC is saying that the players (tournament participants, watchers, data collectors, et. al,) are the reason formats become stale and inbred. It has nothing do with the cards being printed (and pushed) by WoTC. Ignore the man behind the curtain, folks. Nothing to see here. As a scientist, I find it unfortunate that Wizards are deliberately working to make us all more ignorant. I'm really disappointed. As Ryan said, it won't affect our ability to come up with P9 data as both he and I normally participate in the events but the attitude and the reasoning behind it is discouraging. @The-Atog-Lord Yeah, I don't see any justification for this. Sports are statistically analyzed to death and yet their fans still seem to get really excited about them. If they made it public after a delay, say a month, I think it would be a better compromise. They seem to think that the metagame will become stale if the players have all the statistics, but to me Magic is more than statistics; it always seems possible to break the meta by discovering that perfect card. The statistics help the meta get to where its going. If we see that Shops, for example, has a 60% win then more people will start to play Shops. This opens up opportunities for players to come along and innovate to prey on Shops decks. Overtime, I would suspect the win% of Shops to then decrease. Isn't it just constantly changing? Stale? Stale like how? Do we even know if Wizards has the ability to data mine their own results? Half kidding, but the latest @diophan repost of the P9 challenge data makes you wonder if they even have the ability to look at more than one month worth of data. Also: their Post can basically be read as "we can't make this game interesting enough for a large group of people on the Internet" which a.) is likely untrue and b.) if true, it's their fault and not ours. 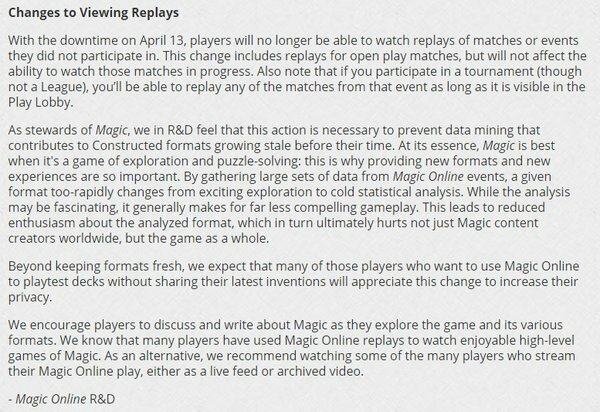 WotC is doing this for the same reason they used to restrict publishing fewer decklists in The Duelist and The Sideboard magazines, the same reason they don't post the winning decklists from ALL grinders at the GP/Pro Tours (they only do a portion), the same reason they don't post results and winning decklists for each tournament on MTGO every day (they have dramatically narrowed what they publish from where MTGO originally started), and the same reason they proactively contact sites like MTGGoldfish and others to prevent them from scraping data. They are intentionally trying to slow formats from becoming "solved" by those with the time and inclination to mine big data. The less data there is, the more uncertainty there is about what the best cards, decks, and strategies are in a given format. It is certainly frustrating for anyone who wants to collect data to measure card and deck performance, but this speaks to the "discovery" line about gaming, and they will continue to do this going forward. We are supposed to trust that they'll make the best decisions with the data, but I don't know many people who trust WotC to do this with any good faith, especially in light of what we've recently seen. I would really like to have wizards decision making process explained to me. It seems like one very stubborn person makes all decisions (and maybe a couple of yes-men). I can't see how a group of people through intelligent discussion could find this to be a smart move. This statement works great for Vintage, but is less true for Standard because there's a lot lesser tools for metagaming against specific decks. Bare in mind that I'm not disagreeing that this is dumb. The problem with this is it seems to assume that metagames are constant and there is one best deck for a given format, and that is almost never true. There is usually a best deck for a single tournament, and then because that deck is well positioned, the other best decks all shift based on if they beat that deck, and maybe lose to decks that deck beats, etc. The meta game is pretty much constantly in flux for most formats, that aren't terribly unbalanced (see modern with eldrazi, or affinity in long ago standard). This really only turns bad when there is a mistake in printings, and then you don't generally need a whole lot of data to see what is going wrong, two weeks of SCG opens for modern is enough to tell us how crappy modern with eldrazi is, for example. This is an attempt to make us less intelligent. Taking away information makes us all dumber. Whatever upsides they feel exist from this, I dislike being made dumber. @garbageaggro Yes, this was my question exactly. I don't play Standard; is it true that in Standard, there is always a "best deck," and that "solving" the format means determining the decklist of this best deck? Isn't that more an indictment of Wizards R&D, than of data miners? Mathematically speaking, with enough data it should be possible to determine equilibrium metagames: for instance, one might (hypothetically) conclude that a metagame with 40% Shops, 30% Mentor, 10% Landstill, 10% Storm, and 10% Dredge is in equilibrium, so that if all Vintage players are currently using these percentages to determine their deck selection, no single player can benefit by going rogue. However it's not clear to me 1) that this kind of analysis is actually useful in the wild, or 2) that having access to this kind of analysis is harmful or makes Magic "less interesting." Heck, even more than a month would be fine. Perhaps after the next premiere event so that you can’t use last month’s event data to metagame. I don’t think that there’s ever a best 60-card deck but there certainly gets to be points where there’s a best “deck” where there’s a best 50-55 cards. Personally, I find the meta-gaming that occurs in those remaining slots to be every bit as interesting. WotC would rather have major changes that are easier for newer players to understand. I think this is especially true in Vintage where two “decks” might have only a handful of cards different between them but they are considered completely different decks. Take the various Vault or Workshop decks as an example. It’s certainly plausible that it’s useful. Actually determining whether it’s useful would require something like building a deck in a complete information vacuum and comparing its results to a deck built after examining recent decks. If I see that no one played Dredge in the last P9 event, I might be inclined to skimp a little on my Dredge hate. Another player might look at the data and determine that players are likely to skimp on Dredge hate and therefore Dredge is a good plan. Then you get the “next level” where I know that you know that I know that Dredge is underplayed! This next bit, I’m going to take an extremely negative view, so be prepared to possibly be annoyed by the pessimism of my conclusions. WotC has said in the past that many B&R decisions are primarily driven by tournament results. While we cannot know the precise metrics that they use with this data, an overview of the data should at least support their conclusions. Having more tournament data allows players to more accurately audit the DCI’s B&R decisions. My conclusion: At least a part of the reason for further reducing the amount of information available to players is to conceal WotC's manipulation of the formats while claiming to be data-driven.